Shenzhen Bo Lin Watch Industrial Company Ltd of China has until recently been a manufacturer of watches for numerous brands. In the last few years, they have decided to offer their own watch brand, NEYMAR. 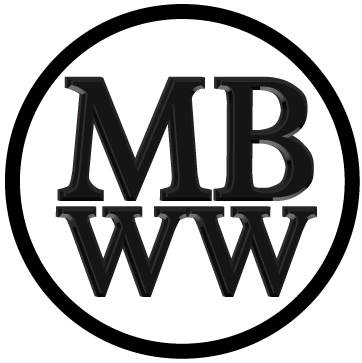 The brand primarily specializes in dive watches. Recently they introduced a new line of high value dive watches, one of which I have here for review. The watch comes in numerous color combinations and can best be described as a Tudor Black Bay homage. This particular model has a deep black face and bezel. 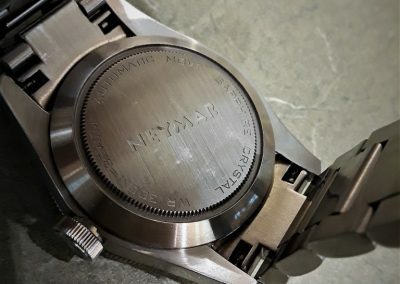 Unlike luxury brands, such as Tudor, NEYMAR proves that tremendous value and quality in dive watches exists in today’s ever-expanding marketplace. This is going to be a controversial watch in microbrand circles as many would not consider it to fit their definition. However, when you think about it, the only real difference is who designs and markets it. The vast majority of micros outsource their manufacture, if anything NEYMAR has truly cut out the middleman. But regardless of what NEYMAR represents, they are building an incredible dive watch. First off, it is powered by the always popular NH35 automatic movement that is being used in countless watches everywhere. There is likely no other automatic movement on the market that does a better job of combining high performance, durability and low cost. This particular example is a few seconds per day slow. The crown requires a little finesse when setting the second hand as a result of its stout screw down operation. What separates this watch from most of its competition is the rest of the watch. The watch measures a perfectly comfortable 41.5mm in diameter, 15mm thick, 22mm lug width and it is 50mm lug to lug. 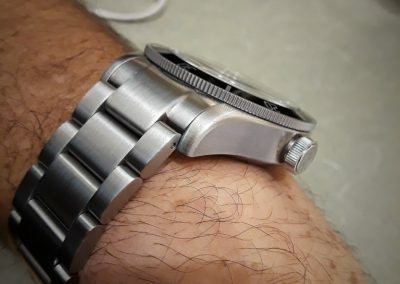 It hugs the wrist well, despite having bracelet links (that are attached to the solid end links) that do not fit flush with the lugs of the watch. The bracelet is a very high quality solid three link design with its only noticeable flaw is the use of stamped clasp links rather than a milled and the pins for the adjustable links do not screw in. The nicely etched, signed, push button, flip lock clasp is unobtrusive with three micro adjustments. The bracelet tapers to a very comfortable 20mm at the clasp. 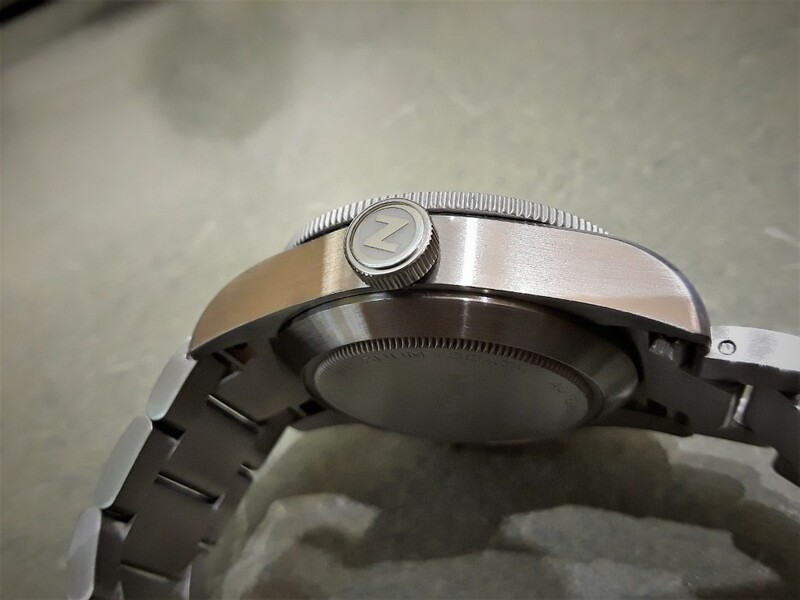 The watch case is completely and carefully brushed 316L stainless steel with a chamfered edge running between the lugs. Finishing is truly extraordinary for a dive watch in this price category. The recessed brushed finish, coin edge case back is laser etched with the brand name in the center and watch information circling near the edge of the case back. 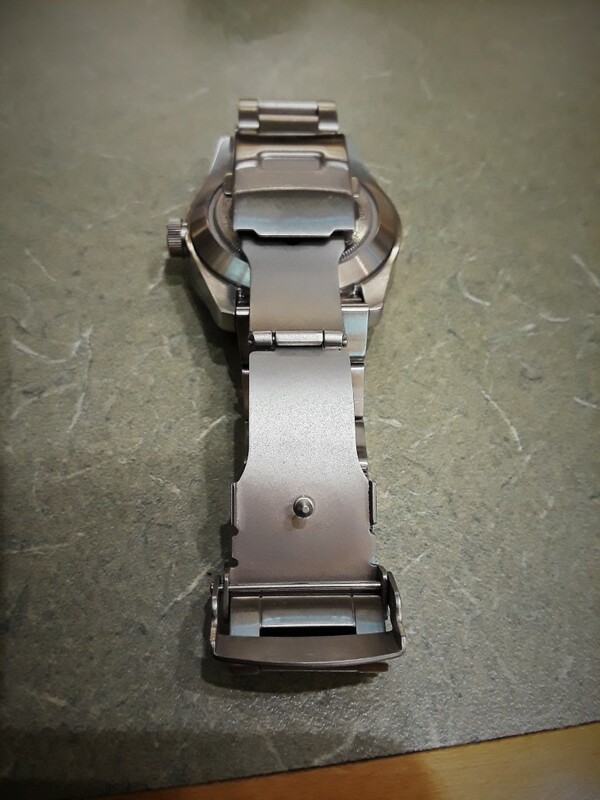 I think this is the first time I have seen an automatic dive watch that only indicates it uses an automatic movement on the case back, rather than on the face of the watch. The 120 click unidirectional, coin edge, silver on black dive bezel is meticulously finished. 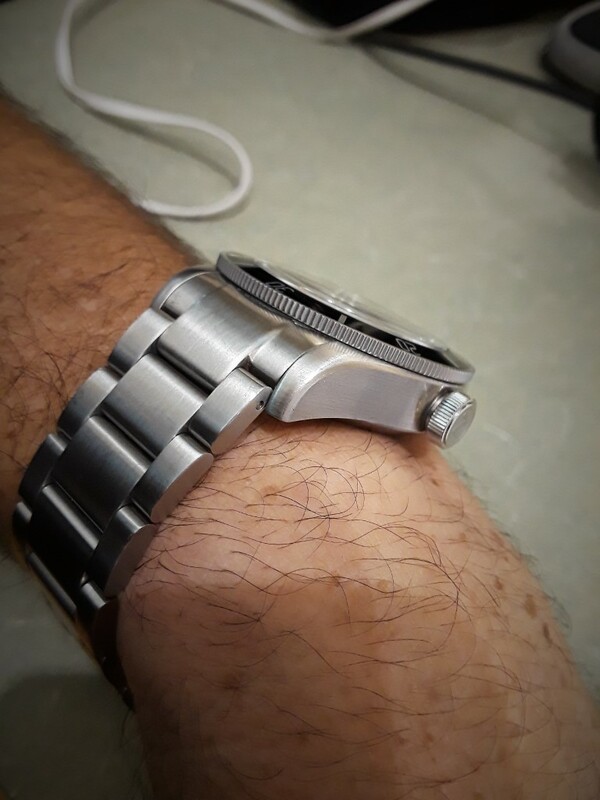 Other reviewers have noted, including myself, this watch has the finest dive bezel action they have seen. The solidity and sound of the bezel and its total lack of back play and it’s perfect alignment is truly outstanding. The face has eleven carefully raised, polished edged and filled indices. 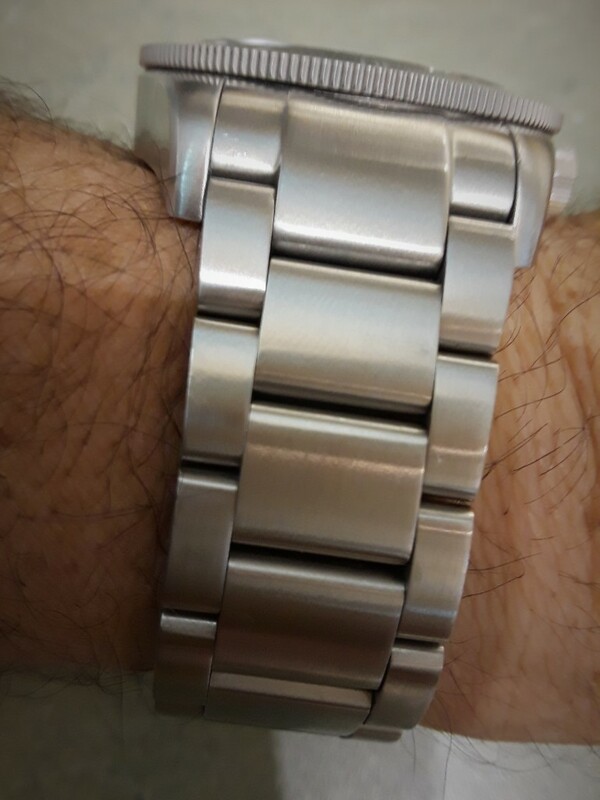 Superluminova BGW9 is used on all of the applied indices as well as the standard polished edge Mercedes handset and polished lollipop second hand. All of the applied indices are round except the 6, 9 and the 12 o’clock downward facing triangle. The black on white date window is at 3 o’clock. 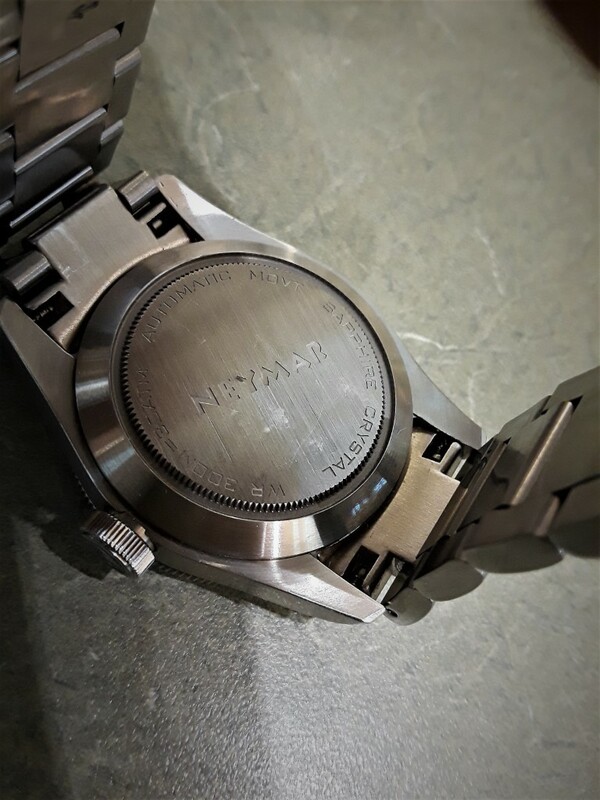 The printed white NEYMAR logo appears on the upper half of the watch face while two printed lines indicate 300 meter water resistance on the lower half of the face. The white second/minute markers are very well done with every fifth index being thicker. There are other significant details on this watch that should be noted. One is the 3 o’clock, 8 mm, polished and etched, signed, gear edged, screw down crown. It is relatively wide and easy to grip, without a crown guard. The other details of this watch that really impress me are the domed, slightly raised, beveled edge sapphire crystal and the very nicely finished 9 o’clock flush helium escape valve. More cool than useful, the valve looks great even if is not really needed. In my opinion all dive watches should come with a sapphire crystal. 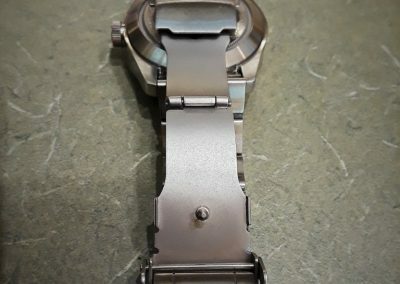 Nothing is overlooked in this watch in terms of build quality. What would I change? I would like to see the watch offered with a 4:30 date window and a 3 on the face with a snowflake hour hand replacing the Mercedes hand. 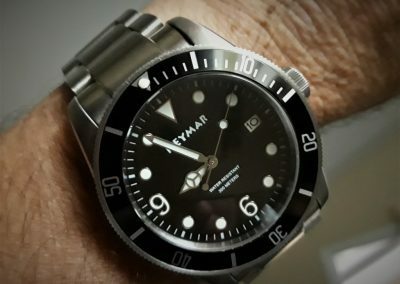 When you factor in that this watch sells for only $159.00 on Amazon, you will see value and quality that is not found on other dive watches at this price point. 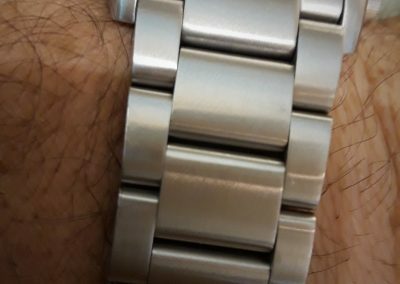 Seiko, for example, doesn’t begin to offer a 300 meter, domed sapphire crystal, helium escape valve dive watch for less than four figures. 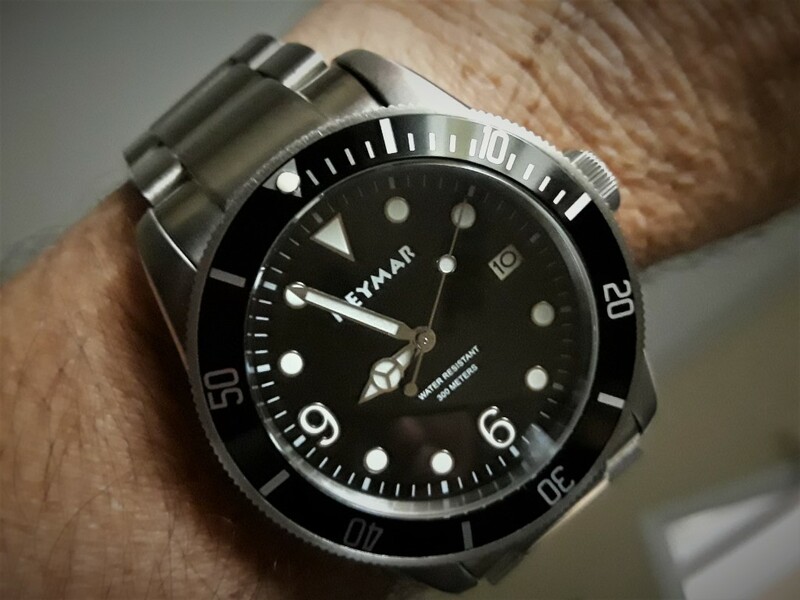 And I do not believe you can find superior dive bezel feel on any dive watch, regardless of price. This dive watch gets my vote for best bang for the buck at this point in time. Neymar-watch.com $159 on Amazon. Great review. Thank you. 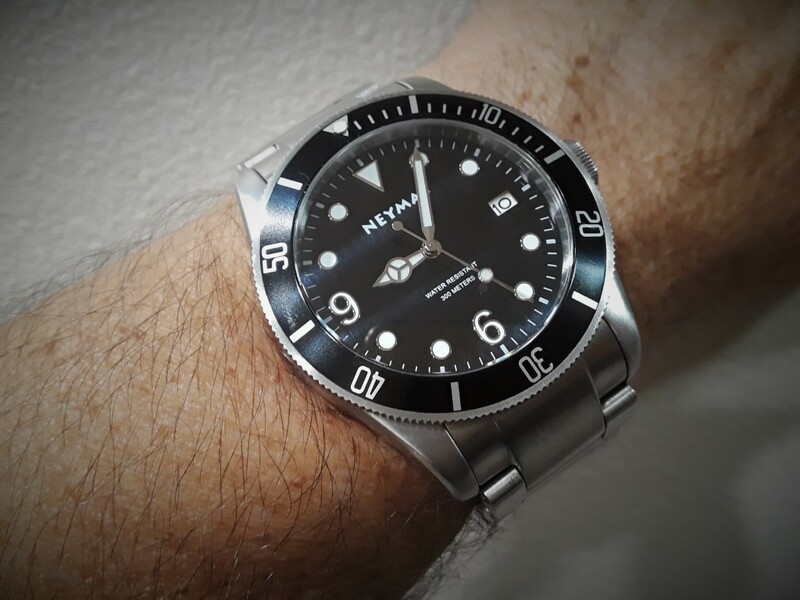 I’ve been looking at the Neymar brand for my next watch. One thing you could note, that a Invicta watches use the same movement and their prices in Amazon are very affrordable with very good performance in the two I purchased.